Space Wars is that age old classic of Space Invaders. 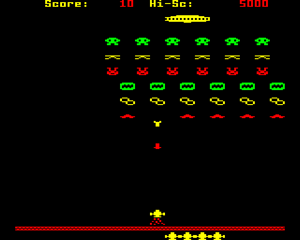 The game pretty much plays as the original did with the main differences being that you have no bunkers to hide behind, the aliens shoot homing missles and the motherships have a rather deadly laser. NOTE: Once you've loaded the disk into your emulator, please type CHAIN "SP.WARS" at the ">" prompt to run the program, as it is a multi-part loader and will not work properly otherwise.